I am very happy to share a thrilling news with you. Maxthon Browser’s CEO Jeff created a new Trello board to illustrate our future development more directly to our users! The main purpose of this board is to list the roadmap of our product for the next stage on public, which helps us to hear user’s voice better. 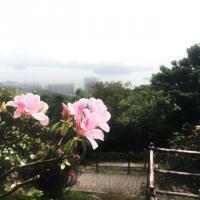 We sincerely welcome all of you to have a visit. We will regularly update this Trello board for the future product plan and here you can easily help us improve our product by voting for the listed features/items you like the most. Our product team will take your opinion into serious consideration and update our product accordingly. You can also subscribe this board to receive our latest messages and updates at the very first time. Oh... It's good, but... times have changed... Now I need tool to protect my privacy: HTTPS Everywhere, Disconnect, Ghostery, Privacy Badger, etc. I can add Disconnect lists to ABP (btw, why there is not EasyPrivacy? ), but what about HTTPS Everywhere or any analogue? Look on Brave (we both know that you know what Brave is). Brave has build-in tools for HTTPS-connection only. This about it. Tooday you really need it, you need it more that other browsers. And think about VPN and proxy. You have clear settings, but... I'm not sure that I can trust any proxy from the web. What about own service or third-party solution? and what about change adblock to ublock original? topic have about 40 votes? I think this is something more than just "change ABP to uBlock"... ABP is not just extension, this is build-in tool and ABP Team (not MX) made it. But you can ask uBlock developer about this. Because uBlock may be just add-on, like NoAds. And users will have choice. I think any ABP improvements is more important question. Because this is still v.1.0.0 without manual blocking. I hope there will be good core update, that will get new updates without staying outdated. Yep. But users need popular lists directly in ABP. There are regional lists only. There are common phrases: improvements, optimization, update, upgrade, etc. But what does it mean? Because even if I don't like what you do with you browser, I still know that you're working. I know that I'll see some improvements, some optimization, some update and some upgrade. But what will be these? Meh, nothing overly interesting. And more to the point, nothing that couldn't be done by posting on the forum, or a link on the forum to a page hosted by maxthon.com. Don't see the need for some other random site to have that info. As for features/improvements... i've said it before, there is a whole section devoted to just that on this forum. All it takes is one person to spend 10mins and collate some info from it (and most of that is in the wishlist thread!). Although it is good to see a rough idea of what the plan is, what they're working towards. The only thing that's vaguely eye opening is Nitro2 with Chrome extension support. If N2 gets it, then I can only imagine MX5 would follow shortly (or MX6?). 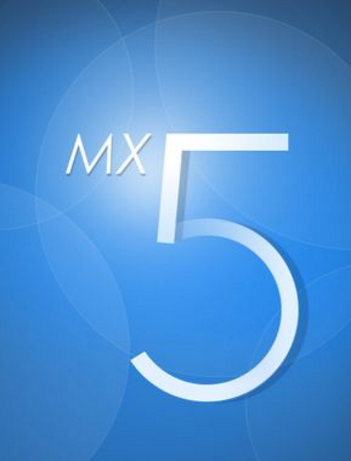 If N2 is anywhere near useful + having .crx support, it might be enough to make users jump from MX5. Not sure if that's a good or bad thing!? And i'm curious to see what the UX improvements turn out to be. Still lots of issues with UI imo. 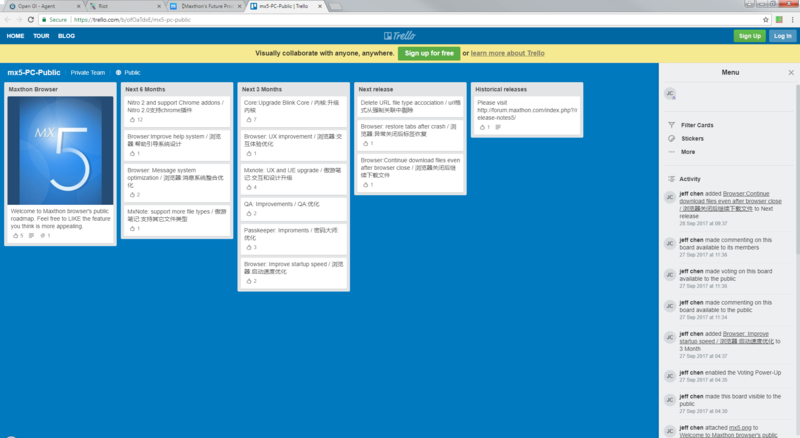 I didn't sign up on "Trello" It looks like everything is in Chinese. So kind of useless to me. I see Chinese with their respective English translations. On the other hand, no activity since Sep 28th doesn't make it sound so transparent to me. If they were serious about being transparent they'd utilise the forum better. Post more information here, and actually give answers to requests whether they will happen etc. Hasn't happened yet, and probably never will. No point worrying about it now though. So doesn't look like they hit their mark, but it is just a roadmap, nothing is set in stone. On the other hand and to be the devil's advocate, it is the first roadmap since Maxthon classic in 2003. With Blink I see the benefit of having the Bookmarksbar again as alphabetically and automatically as the individual Folders in Maxnote. Sometimes more often I use UC Browser, it works for him. MX is too slow. I am still waiting for the Passkeeper Export function. They will not do that, because anything that is somehow transmitted, the danger of being tapped. Maxthon, however, stands for safety. There is no security issue with being able to export user data in Passkeeper. If a user can view the data when logged into the user account, then there is no reason to not be able to save that user's data on the user PC when Passkeeper is being viewed by the user. If a user can view their data on their PC, then there is no security issue in exporting the viewed data on the user PC. Of course you're right, but I just wanted you to explain it to the Maxthon team again. Chromium/Blink 64 contains patches for Spectre and Meltdown. It would be wise for Maxthon to use it ASAP if they do stand for 'safety'. I'll keep checking back and see IF you ever get this browser straightened out. Maxthon just simply HOGS too many resources. Apparently it would. It's been requested countless times and there hasn't been a peep about it. Obviously Maxthon users aren't savvy enough to be allowed to use them?! I've been wanting access to about://flags in Maxthon's Blink core and access to more advanced options via command flags since at least when Karl Mattson joined Maxthon International. Without an export option in Passkeeper, i found a simple workaround to retrieve and save all passwords stored for your Maxthon account. A minimum HTML knowledge is necessary to understand displayed information, and instructions to offline processing of retrieved information is not provided. Be very careful, since saving passwords on a plain file is not safe!!! Login with your Maxthon account. You should be now in your "Maxthon U+" web page: click on "Passkeeper" on top menu (password will be asked again). You will now see a web page with the list of all your accounts and passwords (don't worry if they look "masked" by dots). This is NOT the Passkeeper tool embedded in Maxthon browser, but an ordinary/plain/unprotected web page with the same data. With your browser, now right-click anywhere in the page and select "View page source" or anything similar, depending on the browser (this can be copied/pasted in a text editor or saved as plain HTML file for your own purposes, including offline processing in a more readable way, e.g. in an Excel file). But I refuse to have to "upload" my passwords to be able to export them later. We should have that option without resorting to an account with maxthon. for this Hack. If someone develops a little script to extract data, I'm very interested.